Yellow Dog Patrol: How's Work Going? Here's an example. 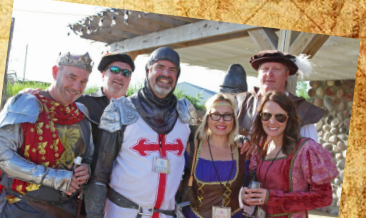 Last week we had our annual sales conference, which was Renaissance-themed. Every conference has a theme, and while not all dress up, those that did not were a handful and were dutifully scorned in fun. Included in this photo are a co-CEO, the company President (and my boss), two of our top sales reps, our newest employee, and me. One of our top sales reps always wanted to go to Machu Picchu, so that's where the company is sending her. The message was delivered via two rented alpacas which sported the signs "Alpaca your bags!" and "You're going to Machu Picchu!" The alpacas were there for about 5 minutes as the program ran late and, according to one of the CEOs, "alpacas don't do well in the dark." Another rep always wanted to run with the bulls in Barcelona. That's where she's going. Thankfully no bulls were on hand for that announcement. This is how our company rolls. This is how appreciation is shown to each other. This is how we celebrate our successes. This is our culture. How's work going? How do you think it's going? This is so awesome to hear!! Love the pic. Yellow Dog Does Emergency Room. Again. Can We Ever Get Along?